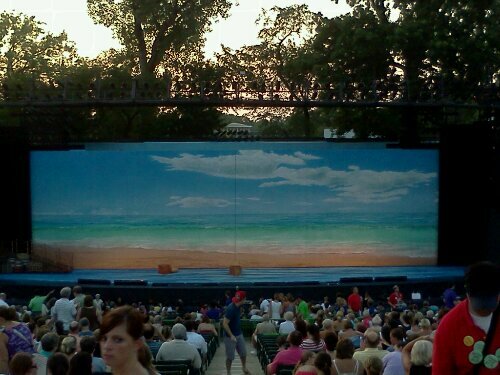 The Little Mermaid was probably this year’s most anticipated production at the Muny. Based on the classic 1989 Disney animated film, this show brought out legions of little girls in princess dresses and mermaid costumes, as well as thousands of other enthusiastic audience members looking for an evening of theatre magic to help transport them from the ridiculously hot St. Louis summer night to the cool depths of an ocean filled with colorful sea creatures. One of the drawbacks of outdoor theatre is that you are at the mercy of the weather, and this time the weather wasn’t showing any mercy. It was so hot outside that I wished we really were under the sea, but this production was so energetic, colorful and well-cast that I was able to take my mind off of the extreme heat and allow myself to be transported to the fantasy world of the show. The stage version tells the same basic story as the film–of Ariel, a young mermaid who falls in love with a human prince– with a few plot changes to make it work better onstage. There was even a note in the program to inform the audience of these changes, and for the most part, I think the show worked very well. The characters’ back stories are further explored–especially those of King Triton and Ursula the Sea Witch, and of Prince Eric, whose motivation for being at sea at the start of the show is further explained. There are also several new songs to help fill out the show, and some of these provided some of the best moments in this production. I thought that Ursula’s fate, drastically altered from the film, seemed a little rushed, and there were parts–“Les Poissons”, for instance, although very well-performed by Lee Roy Reams as Chef Louis–that didn’t seem necessary to the plot (I thought this song in particular worked better in the film). Still, overall it was a very enjoyable story and managed to adapt the film story in a way that made sense for the stage. The biggest strength of this production was the excellent cast. Patti Murin made a strong, earnest Ariel, with a lovely voice and great stage presence, and she was well-matched by John Riddle as a suitably handsome and charming Prince Eric. I like that the stage version took a little more time with their love story than the film did, and they made a delightful couple. Muny and Broadway veteran Ken Page was also a standout as King Triton, giving the character just the right combination of authority, strength and fatherly affection. Lara Teeter was great as Scuttle the Seagull, with excellent comic timing and spectacular dancing skills. His Act Two opening number “Positoovity”, in which he and a chorus of other gulls try to help the newly-transformed Ariel get used to her new legs, was a showstopper. Also noteworthy was Teeter’s 9-year-old daughter, Elizabeth, who played Ariel’s fish-friend Flounder with a great deal of energy and spirit, especially in her delightful number with Ariel’s mermaid sisters, “She’s In Love”. Francis Jue as Sebastian gave a fine performance with a funny little way of walking. Paul Vogt was a suitably menacing, enthusiastically evil Ursula the Sea Witch, and Matt Braver and Max Kumangai were a comic delight as Ursula’s henchmen, the electric eels Flotsam and Jetsam. Also, the very large ensemble of colorfully-costumed children playing various sea creatures helped to fill the stage for lively production numbers like “Under the Sea” and “Kiss the Girl”. I had so much fun at this show. It’s almost pointless to criticize a show like this, because it was so well-performed and everyone onstage seemed to be having so much fun. That fun was contagious, too, and the audience seemed to love every minute of the show. If I had to say anything negative, it would be that some of the costumes could have been more elaborate, such as the mermaid dresses and the seagull costumes, but the show was so much fun and the performances were so universally excellent that little things like that don’t get in the way of the enjoyment of the show. The sets were colorful and whimsical, creating an atmosphere similar to an animated film, and the choreography, especially in the big production numbers, was crisp and full of energy. The overall effect was of excitement, adventure and joy, and even despite the notorious St. Louis summer heat, it was a delightful experience.